That Langholm's High Street is part of the route of the A7 - a major route across Scotland - is an historical accident. However, the traffic on the road has clearly grown well past the volumes which are reasonable to send through the narrow streets of a village of 2300 people. Sadly, this is a scene repeated across the UK. Many small and pretty villages are blighted by absurd numbers of motor vehicles which pass through their centres. I am not aware of any situation where a Dutch village puts up with conditions like this. There are plenty of villages which have narrow streets, but they do not suffer the same blight of having these streets used as major thoroughfares by drivers who are just passing through and will never stop to discover the delights of the village itself. Note that the N760 is not so busy as the A7 and that speed limits outside the villages are restricted to 80 km/h maximum, and often 60 km/h rather than the 60 mph / 100 km/h normal across the UK. The signs look similar, but they are not. In Langholm the speed limit is 30 mph / 48 km/h while in Grafhorst the speed limit is 18 mph / 30 km/h. 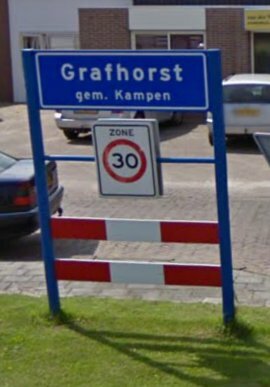 That is the normal speed limit in the Netherlands for roads in villages. 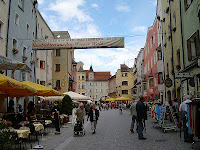 However, it is the removal of through traffic that makes the village streets pleasant. Residents of Langholm are campaigning for little more than a lowering of speed limits through their village to 20 mph (32 km/h). It's a start, but they're not asking for remotely enough. While such volumes of traffic are allowed, even at a lower speed, they will continue to dominate the village and continue to affect the lives of those who live there. This village needs a bypass, and by bypass I mean something which keeps through traffic completely away from the centre rather than the British concept of a bypass which sadly often serves only to provide a parallel alternative route. A bypass would of course be expensive. However, at this time the money is available. Billions have been set aside in the UK for infrastructure spending in order to stimulate the economyy. It can be spent on pointlessly increasing the capacity of roads between the places where people live or on improving the conditions of those who currently are blighted by roads which are already too busy. It is for British voters, councillors and politicians to decide on the most sensible way to spend that money, in Langholm and every other afflicted city, town and village. Streets just as narrow as those in Langholm abound in the Netherlands. Because they are never used as through routes for motor vehicles, they are pleasant places for people. These changes need to be made not only for adult drivers passing through or for those rare adult cyclists who "brave" the conditions, but in particular for the most vulnerable members of our society, children, older people and those with disabilities. If we're not interested in improving the lives of the next generation then who are we campaigning for ? Perhaps unsurprisingly, some correspondents from the UK made excuses of the usual form about how Langholm is "different" from the Netherlands and therefore a bypass would be difficult. It often seems to be assumed that everything is easy in the Netherlands simply because of the relative lack of hills, but nothing could be further from the truth. Actually, engineering here has been on a grand scale. The Dutch have built some of the world's longest dykes and the world's largest moving barrier. They also reclaimed land which forms the world's largest artificial island, and run trains though tunnels in soft ground below the water table. 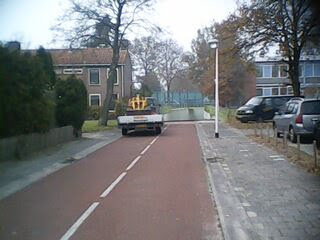 Just in the last few years in Assen we've seen a canal moved sideways by 2 metres to make space for a secondary cycle-path, and a bridge carrying a dual carriageway built to keep cars out of the way of cyclists. There are now plans to dig a tunnel to remove cars from the outside of the railway station. Major projects are common in the Netherlands even in small towns because they make life better. The only real difference is in the will of the people to demand decent infrastructure. Of course, people still point at the relative lack of hills as if this excuses inaction in the UK. However a correspondent sent me a helpful example of a village in Austria which is a similar position to Langholm. Rattenberg used to have a rat-run through its centre, which is now rather attractive as shown to the right. 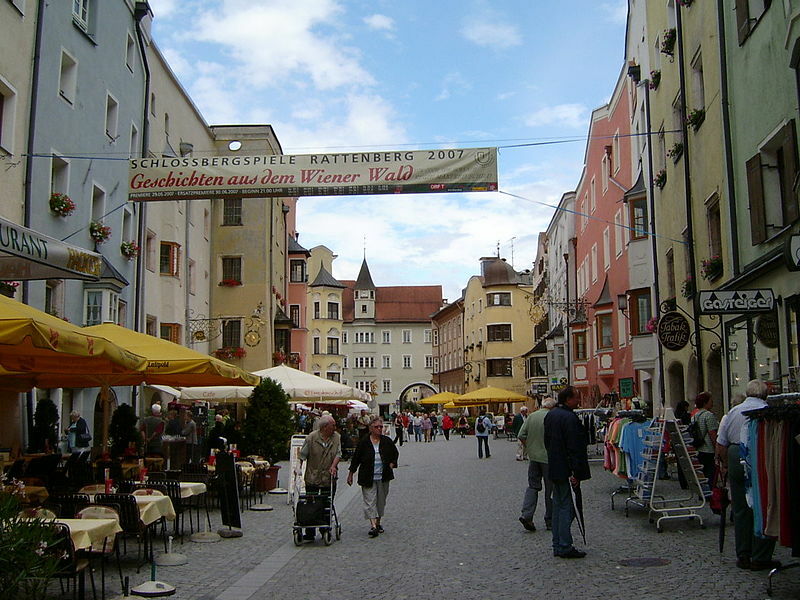 Rattenberg was transformed by building the Rattenbergtunnel which bypasses the centre of the city by passing through a hill. Exactly the same approach could be taken in Langholm. Finally, this blog is not just about Langholm and the problems in the centre of one small settlement. Rather, my interest is in the similar situations in hundreds of small towns and villages across the UK and in other nations, each of which are blighted in a similar way, regardless of the relative difficulty in removing their through traffic. The low aspirations of many campaigners make it easy for too little to be done to resolve problems. On Thursday Judy and I both finished all the work we had to do by mid-day. In the morning, Judy had been busy organising holidays while I'd packed 20 parcels and taken them to the post office in the usual way. For some time we'd been planning to visit a bicycle museum 25 km West of Assen. Over lunch we decided that's what we'd do in the afternoon. I got to try out an understeer bike. It's surprisingly easy to ride. The museum has many bicycles of different age, method of design and manufacturer. Almost all were real workhorses intended for daily use. A "Bartje" brand child's bike - from Assen of course. Bartje is a symbol of Assen and Drenthe. There is a statue of this fictional character in the city. Because the books were not translated into English, I didn't get to read them when I was young, but I'm catching up now. As well as complete bicycles, many of the sort of components that you need for a bicycle which provides reliable everyday transport were in the exhibit. The museum also has a collection of sewing machines. This might seem odd until you realise that they were manufactured by the same companies, both being examples of the highest technology that you'd find in a home in the early 1900s. Gazelle and Union sewing machines are seen above, also there were examples of Burgers, Simplex and other Dutch bicycle manufacturers. There are Singer bikes and Singer sewing machines as well, but so far as I'm aware they were always different companies. We took it easy for the rest of the way home and didn't make any attempt at all to keep up with racing cyclists that overtook us on the cycle-paths. When we reached road works, we were not at all inconvenienced. A very pleasant afternoon of cycling and visiting interesting places is the closest we ever want to come to a "team building" exercise for our business. We were back to work again on Friday morning. The museum and butterfly garden are amongst many nice places to visit on our holiday routes. You'll find components for everyday reliable bicycles in our webshop. 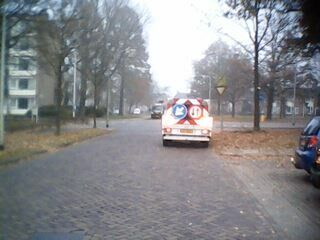 Just like anywhere else in the world, maintenance vehicles in The Netherlands sometimes stop on cycle-paths. I took this photo on the way to the shops a few days ago (the same route as in this video). Of course it is a bit of an irritation when vehicles like this stop on the cycle-path. However, usually they pull off the cycle-path, and when they have no choice but to block it, they only block half of it. As vehicles like this are usually there for a good reason and really not much of an obstruction is caused, few people would complain. Just 200 m away, a van "blocking" a residential street. Of course, it's not just cycle-paths that occasionally have maintenance vans parked on them. Maintenance is also needed on roads and streets. Just around the corner from the first example, I spotted the example to the right. Again it's not really causing much of a problem because it's only blocking half of the street. The same situation, the same level of inconvenience. Equal obstacle opportunities for roads and bike-paths ! Of course, the problems caused by maintenance vehicles on cycle-paths would be much greater if there were not so much room. This is an advantage of having sensible widths for cycle-paths. The cycle-path in the photo at the top is not special. It's simply part of a normal, everyday route. Standards need to be high everywhere so that conditions are good wherever someone chooses to cycle. It's no good if high standards are reserved only for a few special pieces of infrastructure. Read more about the need for a tight grid of high quality cycling facilities. Note that when there are ongoing road works which cause real disruption, Dutch cyclists are not forgotten.